Being a busy mom of four is not an easy task. My children keep me hopping from sun up to sun down and there are some days that I wish there were three of me. I just don't seem to have enough hands. When all three of my older children were babies, I always ALWAYS had a pack 'n play nearby. I never had a fancy one with all the bells and whistles, but just having the play yard was enough at the time. Pack and plays are the new version of play pens. Remember those? My mom had one and it was so handy, she used it all the time. When I registered for baby items for my first baby I made certain I had a Pack 'n Play on my registry. I knew for a fact that it would come in handy and boy was I right! I would wheel that pack and play all over my house. It was in the kitchen, my bedroom and my livingroom...anywhere I was, baby was nearby within view. My first baby was very attached to me (all of them were, actually) and had to see me all the time so a pack and play was a no-brainer. Now that I have had three children and now our newest addition, I have a worn out pack and play. It sure has gotten alot of use and I was due for a newer one. Well, you can imagine how excited I was when I received the opportunity to review a new Graco Pack and Play and this time, I was getting one with ALL the bells and whistles. Graco is by far, my favorite and most trusted company for baby gear and when someone asks me, I tell them that Graco is the company I love. Their products have lasted me the longest and have held up the best. So, for this review I was sent the Graco Pack ‘n Play Playard with Nearby Napper in the Trinidad design. I was really excited because this particular pack 'n play comes with some neat features that I have never been able to enjoy before so I was looking forward to checking all the fancy features out. Secondly, there is an attachable changing table that securely clips right onto the play yard. It is curved on either side to help baby stay put while you change them. There is no seat belt though so be sure you stay close to baby when using this changing table. It has a soft area on which baby can lay, which is nice. I absolutely LOVE the two in one Portable Newborn Bassinet & Napper . This is so cool! First, you have a small bassinet that has netted sides, making it perfect for newborns and babies up to 15 pounds. The base can rock or you can flip up the rock stops on the ends of the legs and the bassinet will sit still. This bassinet can then be rotated and turns into a seat in which you can belt the baby in securely and all them to snooze, play or do whatever. You can use this piece with or without the pack 'n play and would be PERFECT for travel if you didn't want to take the entire pack and play with you. There is a cute little battery operated mobile that clips onto the bassinet/napper and doesn't get in the way when you rotate the bassinet around. Simply push a small button on the post of the mobile and it begins to move. My daughter just stared at this mobile...she loves things like that. 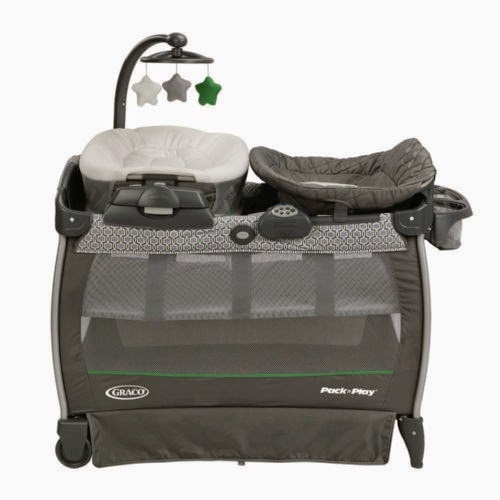 Some of the smaller features that come with this Pack 'n Play are the easy to rotate bassinet/napper. Simply push the button and pull up on the bassinet and it rotates very easily. There is also a nice electronics module that clips onto the rail of the pack 'n play. This module does a number of things. It provides ambient lighting, music and nature sounds and also has a convenient timer that runs for up to 15 minutes. So, what do I NOT like? The Pack 'n Play itself stores nicely in a zippered bag while the other two parts - the changing table and bassinet/napper have no bag in which they can be stored. I ended up putting them into plastic garbage bags to store. I wish there was separate bag into which I could put both of those pieces so they could stay together and not take up so much room. That is about all I didn't like about this particular Pack 'n Play. All things considered though, I simply love this Graco Pack 'n Play. It is versatile, easy to use once it is put together and offers many different options for baby. I would definitely recommend this product to any new moms or even, to moms who have been around the block a few times, like me. :) Very cool product with much to offer. Check it out today! Disclaimer: I received no monetary compensation for this post. I did receive free Graco products for review purposes. All quotes and stock photos are from the Graco website and email. All thoughts and opinions are 100% mine. This thing would make new baby daily care so easy. Is all the material removable for easy washing? Alot of the material is wipeable, but I have never had to actually remove the cloth pieces. While assembling it though, it does come apart easily so it would seem like it would be easy to clean. Can you tell me if you found additions to what is already there (such as sheets that fit this pack and play that you have found or the bassinet pad)..do you have additional items for the attachments that it comes with and where did you find them to fit this particular pack and play? I have sheets but I found them at garage sales. I am sure local mass retail stores would carry those, so you would have to check there. I also have not had to buy anything additional to go with this pack and play so not sure how I can help you there. Thanks for your comment! Is the reversible bassinet something newborns can sleep in at nighttime rather than just for naps? If so, about how long did your baby last in it until he/she grew out of it? Thanks! My daughter was too big for it and was already in a crib when I conducted my review. However, I would use it for a newborn during the night and also at night. Because every baby is different, the time frame might be different as to how long they could sleep in it comfortably.